Hmmm... The phrase "past performance" does come to mind. Digging deeper into history gives these numbers. Number of times a CST-100 of any flavor has flown into space - 0. Number of times a Dragon of any flavor has flown into space 4. We are not discussing any spacecraft that are not part of this specific Commercial Crew program. We ARE discussing CST-100, DreamChaser and Dragon - ONLY. Specifically the CST-100. Read the Thread title. Do we even know when (or if) CST-100 has a launch abort test scheduled? And once they do that, will they do a max-Q abort test? No. Nothing funded or scheduled under CCiCap. Assuming a schedule is published and Boeing wins a CCtCap award, we'll know in August. I was speaking to use of particular CCiCap milestones or out of context as a questionable indicator of who is "ahead" with respect to commercial crew. In particular, that both SpaceX and Boeing will be at CDR soon and at approximately the same time (which was/is a key CCiCap objective), and thus in that respect they should be at relative parity, all other things equal. Of course all other things are not equal, and whether they balance is an open question. Yes, the SpaceX COTS/CRS flights must surely count for something (I was not disputing that); in the CCiCap selection statement, SpaceX received a plus for leveraging Dragon cargo into Dragon Crew (among other things). OTOH, Boeing received a plus for their approach to certification (among other things), and the highest technical confidence score (above SpaceX). Please give it up Ed and whoever else. These are not updates. These are not discussions of updates. These are silly back and forths after a silly absolutist comment about relative standing. What good can it do to spit back a litany of well known facts? Boeing and SpaceX are taking very different approaches from very different positions. We all have our opinions, none of which will change and none of which has any real importance. Let's all hope and look for some real hardware news that we can share, discuss, and learn from. The first CST-100 test flight will launch in late 2016, with the first manned mission planned for early 2017.
edit: Assuming of course Boeing wins a sufficient CCtCap award. Is CST-100 still being discussed for station reboost with its unused launch abort propellant? Are any of the other contenders offering this capability as well? It would seem to be a valuable service and an efficient means of applying propellant as opposed to dumping it. And has the question of its service module (ring) accommodating a cargo load ever been fully answered? Chris Ferguson, commander of the final space shuttle flight, virtually returned to space in the Boeing Crew Space Transportation (CST)-100 simulator, when he recently performed manual piloting activities, including on-orbit attitude and translation maneuvers, docking and backing away from a virtual International Space Station, and a manual re-entry to Earth. This is in service of the pilot in the loop ccicap milestone. More at the link, with video. A scale model of Boeing's CST-100 spacecraft with an Atlas V rocket successfully underwent a fit check, verifying that the model accurately fits the hardware that will be used during dynamic stability testing in NASA Langley Research Center's Transonic Dynamics Tunnel (TDT) this spring. Boeing is one of three American companies working with NASA's Commercial Crew Program (CCP) to develop safe, reliable and cost-effective crew transportation systems during NASA's Commercial Crew Integrated Capability (CCiCap) initiative, which is intended to make commercial human spaceflight services available for government and commercial customers. Triumph Aerospace Systems, Inc. in Newport News, Va., built the model in collaboration with Boeing Space Exploration of Houston. NASA Langley will provide expertise and facilities to characterize the dynamic stability of Boeing's CST-100. The test will consist of two dynamic stability test techniques, known as free-to-oscillate and forced oscillation, which will characterize the external forces the spacecraft could experience during an emergency abort from the launch vehicle. Characterization of the test equipment and lessons learned will be directly applicable to future test programs. Additionally, the test will help maintain the center's critical skills in highly specialized areas and unique facilities, and generate revenue for the center. Ummm. Congratulations Triumph Aerospace Systems on fabricating an aluminum model to fit another model? As the design evolves, will they be producing more of these? I'm not sure which is more impressive, this, the cardboard mock-up Boeing's been showing off, or the fact Boeing was able to get and continue to receive funding. Seriously, SpaceDev has fine-tuned construction techniques, built and tested a composite aerostructure while continuing work on their hybrid rockets and escape system. 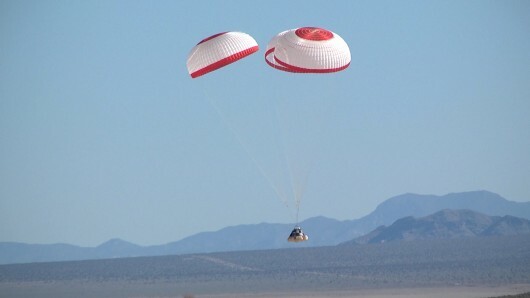 Dragon is already flying with continued work on their escape and landing systems. Boeing has --- a small scale chunk of metal made by someone else? It reinforces my long-standing view that their contract is black cover and will never see completion. Boeing has done all the things you mention and more. The video is from NASA Langley, and is therefore highlighting the work they do at that center. What are these? You should do a little research before making such unsupported statements, which is nothing more than biased opinion. Biased? Not at all, against who and quite the discreditive assumption. "Payments are made only after partner demonstrates that the milestone criteria have been successfully met." Based on their own 2013-2014 roadmap, Boeing is very far behind and I doubt they'll pass the Critical Design Review Board in April this year. They've done the PR work, but not the engineering. In April, like Blue Origin, they can thank us for the cash, fold the program and we'll be down to two programs - unless someone else could use funding for unspecified reasons. IMO, of course, but by no means "biased". 1. Boeing has yet to surpass Blue Origin's well-funded development who was cut after CCDev2. 3. Boeing's road map is not NASA's. They are meeting NASA's schedule. 4. IMO doesn't cut it, you need to have data to back it up. Jim is there room in Boeings design to use a "berthing" hatch if needed quickly in the future? Any opinion if a cargo return version could quickly be put together (crash program) if needed? Unneeded. The new CRS contract allows contractors to transfer cargo through docking port, although certainly a CBM would allow larger cargo. I agree with your other points. But how do you know that Boeing will be a finalist for CCtCap? If their price is out of whack with the rest of the competition, they are likely to be downselected. Apparently, NASA intends to ask more skin in the game from participants for the next round, that could also hurt Boeing if they are not willing to do so. NASA is not budgeting for a down select.